My mom is a good cook, and she cooked for me every day when I was growing up in Slovakia. But the only dish I can vividly remember from my childhood is this cold fruit torte (studená ovocná torta) shown in this recipe. Mom is now back in the USA so I had her show me how she makes this amazingly simple, but truly delicious treat. You need to thin the sour cream (kyslá smotana). Sour cream in Slovakia comes in consistency resembling heavy cream. Add some milk or kefir until you get something that can be poured out. 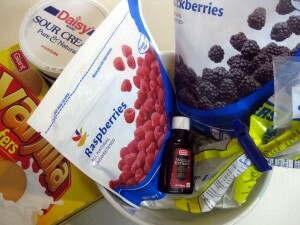 Also add a tablespoon of sugar and the lid’s worth of vanilla extract. Then make a layer of the vanilla wafers (piškóty) on the bottom of a fairly large bowl. Top these with a layer of berries. Then pour over one third of the cream. Push everything down with the back of a spoon. The berries were still frozen since we just came back from the store with them, when you do this, let them defrost a bit first. Then repeat. Make another layer of wafers, fruit and cream. And repeat again, finishing with a cream layer. I also decorated the top with few extra wafers. Place in the fridge for several hours, or overnight. Then the next day, carefully scoop out and enjoy. The result is little messy, but boy, so delicious! This dessert has a very unique, sour berry flavor mixed in with the sweetness of wafers. You gotta try it. I also grew up on this one. A few variations my mother experimented with: instant coffee added to the sour cream along with a vanilla sugar, cocoa powder, jahodove granko (I guess strawberry nesquick would do). Cau Slovenka, that’s a great idea to add coffee to this desert. I have not though of that but I bet it will give it a nice flavor. I’ll try it next time I’ll make this desert. I use the springform for cakes, so it holds nice shape. I use sourcream filling even for f cake, where in the layers of actual cake I put sour cream mixed with sugar and different kinds of fruit(bananas, mandarin oranges). On the top I decorate with whipped cream and fruit(blueberries, kiwi, strawberries). You surely got me hungry for it. Hi Lucia, does the springform come with some slots for the individual slices? I have actually thought of using a spring form (don’t have one, but thought that maybe it would work better), but then wasn’t sure whether I wouldn’t have the same issue with the filling leaking out on the sides when you separate the slices. Presumably you can stick it in the freezer for a bit before serving to solidify the filling. Thanks for the tip on decorating. I also thought of putting some fruit on top, but we ended up putting all there was inside, so there was none left by the time we finished. I have to admit not using frozen fruit, used canned or fresh. I think frozen one is kind of full of liquid, so maybe it would be worth letting it out and drain some of its juices(I am not sure if you tried that). When I make it I have no issue with collapsing slices. This is my favorite slovak dessert so far. It’s yuammy. Not too sweet, not too sour hmhmm…. This is Katarina, Lubos’ mom. Lucia, I think you are correct in your observation that frozen fruits have more water. I made this cake again for my friend this past weekend and the final product was little messy and did not keep together. We again used frozen fruit. Next time I will use fresh or canned fruit. Actually fresh fruit is the best. One more thing I wanted to mention, as I looked at list of ingredients in your recipe, I don’t use vanilla extract. I use few packets of vanilla sugar. I think it is better to go without added liquids. Of course I had to not notice one more thing, you were adding milk/kefir, I don’t do that at all, just lots of sour cream. That will definately prevent colapsing of cake. Have you actually been able to find vanilla sugar in the states? The reason I use the liquid is that is the closest substitute I found here in the US. Also, the sour cream you use, is it really thick, the way it comes in the States, or is more like the Slovak version, which is actually liquid? You can find vanilla sugar in the store called Cost Plus or World Market (same store but goes by both names in CA). I think you can find these stores also on the East coast (found one last year in Richmond, VA). The store sells variety of Dr. Oetker products. For the cake, I always use powdered sugar since it contains a small amount of corn starch that thickens the sour cream along with a packet or two of vanilla sugar. If you are planning on using frozen fruit, it should be left sitting in a colander for several hours to drain the liquid. Mirka, thank you for all your comments. We have World Market near by, I was actually there just a week ago looking at the various European specialties. Here in the D.C area we also have German Gourmet and Russian Gourmet. Both stores have an amazing selection of European goodies. The folks at the Russian store in McLean speak almost no English, so brush up on your Russian before going there. Have you found there to be a noticeable difference between vanilla sugar, and using a dash of vanilla extract and powdered sugar? I bought vanilla sugar online before(hungarian website), but also brought like 30 packets last time I went to Slovakia. I heard you can make your own vanilla sugar by putting vanilla bean(none of my stores have it) in the jar full of regular sugar and let the flavor infuse in the sugar. Sour crem, I don’t really see a difference in it, I used the brand you got on picture, but used also whatever storebrand that said natural(the regular version seemed to me a little bit salty). Once I mix the sour cream with sugar it is pretty liquid, but thickens in the refridgerator. I do what Lucia did and put vanilla pod into a jar full of icing sugar. Wonderful-lots of vanilla sugar and the falvour is quite strong, too. Lubos your cake looks great but I have an alternative for those of us who are not keen on sour cream in desserts (I find it too sour). Whipped cream works well, too-that is my preferred variaton.